In the previous post, I talked about ‘Women in Korea (2)-1: swish of skirt in 1980s’. This education fever still remains in Korean society but mothers (ajummas) today followed different ways that I called ‘digital swish of skirt’. 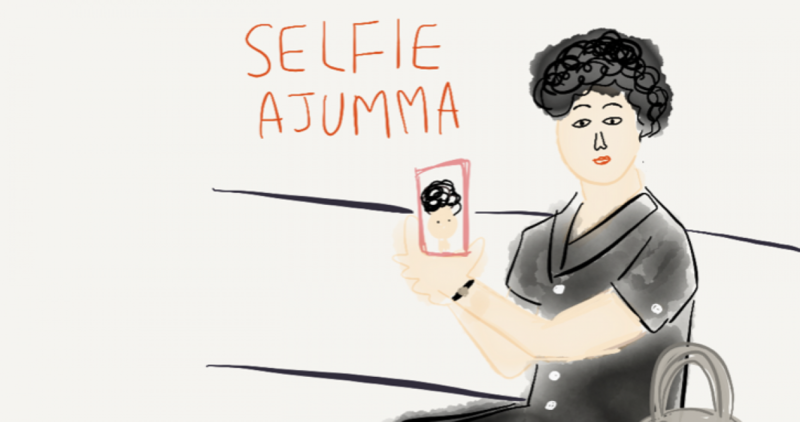 Compared with non-smartphone era which is from 1980s to early 2000, the use of smartphones change our life styles in many ways likewise the enthusiasm of education among ajummas. This means that ajummas could be able to get involved in supporting their children’s education easily through using their smartphones. There are various apps that helps mothers (ajummas) to share useful information about their children’s education for example, “Which Hak-won (private educational institution) do you go?“. This app provides people’s various opinions and useful information about private educational institutions for parents and their children. So it helps both parents and their children to choose better private educational institutions. This app determines the ranking of private educational institutions according to the actual statistical data. Parents can ask questions or answer others’ questions interactively through using app on their smartphones in real time. There are many types of apps for parents who concern their children’s education in Korea. I cannot enumerate every app in this blog but one thing that I can say is these types of apps for parents are increasing significantly. The term ‘swish of skirt’ is not used broadly today but I can see the swish of skirt phenomena still remains today. I call it ‘Digital swish of skirt’. Ajummas (mothers) are overly involved in their children’s education today through using education related apps on their smartphones. They becomes smart ajummas. 한국여성에 관해 시간순서대로 짧게 요약해서 이야기하고 있는 두 번째 포스팅이다. 한국전쟁 직후의 여성 들은 전쟁 직후의 나라와 가족을 위해 어린 여학생들 까지도 공장에 다니며 돈을 벌었고 한국경제를 살려내는데에 주축이 되었었다. 그 이후 1980년대와 1990년대에는 중년 남성들이 주축이 되어 현저한 경제성장을 이룩하는데에 큰 힘을 보태었다. 특히 제조 부분의 수출이 급성장 하게 되었고 한국의 경제는 안정을 찾기 시작하게 되었던 것이다. 물론 1980년대에서 1990년대에도 열심히 일하는 여성들이 있었지만 이 시기에는 대부분의 기혼 여성들은 결혼 후에 직장을 그만두고 가정에서 아내로 그리고 엄마로서의 역할에 더 충실하게 되었다. 다양한 이유가 있었겠지만 그 당시의 기혼 여성들은 결혼 후에 퇴사를 해야하는 경우가 대부분 이었고, 따라서 본인의 의지에 따라 혹은 본인의 의지에 상관없이 상당수의 기혼 여성들은 (모두가 아닌) ‘현모양처’를 꿈꾸며 엄마와 아내의 역할을 이어나가게 되었다. 이에 반해, 기혼 남성들은 거의 대부분이 밖에서 일을하며 가정의 경제적인 부분을 책임지는 ‘가장’이 되었다. 즉 1980년대와 1990년대의 가족의 모습은 ‘남성’은 가장이 되고 ‘여성’은 현모양처가 되는 전형적인 가부장적 가족이 대부분이었다. 따라서 여성은 집안에서 ‘힘든 집안일과 육아’를 도맡아 해야 했고, 남성은 집밖에서 ‘가족의 생계를 책임’질 수 있도록 열심히 일해야 했다.가족의 생계를 위해 아침일찍 출근해서 야근은 기본으로 자정이 훌쩍 넘어서야 집에오고 또 주말에도 일을 하러 나가야 했던 ‘아버지’들을 통해서 왜 한국남성이 전세계에서 가장 일을 많이 하는 집단으로 조사가 되었는지를 잘 알 수 있다. 이로 인해 집안일과 육아는 오롯이 ‘엄마’의 몫이었고, 한국의 가정은 아버지가 빠지고 어머니가 주도하는 가족의 모습으로 바뀌어 갈 수 밖에 없었다. 자녀들과 어머니는 그들의 아버지와 남편을 볼 기회가 매우 적었고, 가정에서 일어나는 모든일은 여성이 혼자 감당해내야 했었다. 가정의 일이라는게 단순히 육아와 집안일만 있는것이 아니기에 대한민국의 어머니들, 즉 기혼 여성들은 점점 강해져 갈 수 밖에 없었고 자녀들은 그런 어머니에게 점점 더 의지하게 된 것이다. 집안에서 어머니의 역할은 ‘엄마와 아빠’의 두 역할을 해야했고, (물론 아버지 또한 가족의 생계를 위해서 일을 해야했기 때문에 가족과의 시간을 보낼 시간이 부족했었다. 이는 아버지의 탓이 아니다) 특히 어머니들은 자녀의 교육에 힘을 쏟았다. 소위 ‘극성 엄마’가 된 그 시대의 (여전히 지금도) 어머니들이 왜 그렇게 자녀교육에 힘을 쏟았는 지는 다양한 시각으로 설명이 될 수 있다. 내가 리서치를 통해서 짐작해 볼 수 있는 것은, 그 당시의 어머니들은 ‘좋은 대학에 들어가는것’이 그 무엇보다 가장 중요한 것이라고 믿었고 또한 남편의 부재에 따라 (회사일로 인해서 바빴던 그 당시의 아버지들) 가정과 육아는 오롯이 ‘엄마’의 것이었기 때문에 자녀에 대한 관심과 열정이 더 강했었던 것 같다. 더불어 그 당시의 어머니들은 결혼과 동시에 ‘현모양처’가 되어야 함을 강요받았기 때문에 자신들의 능력개발 보다는 어쩔 수 없이 집에서 ‘가정주부’가 되어야 했으며, 따라서 그들이 열정을 쏟을 수 있는 곳은 ‘자녀의 교육’이 되었던것 같다. 이러한 엄마들의 자녀교육에 대한 열정은 극성엄마를 만들어냈고, 극성엄마는 ‘치맛바람’을 일으키게 되었다. 다음 포스팅에서는 ‘치맛바람’에 대해서 이야기 해 보고자 한다.